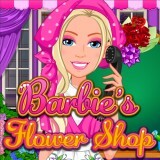 In this game you will have to help this cute Barbie to become a real flower girl! She opened a flower shop and now she has a lot of bouquets to do. Are you ready to help her? Then do not waste your time and do all the orders of clients. Enjoy the game.